Nadine Doolittle, Iced Under (Bayeux Arts/Gondolier). John C. Goodman, Talking to Wendigo (Turnstone). April Lindgren, Headline: Murder (Second Story Press). Howard Shrier, Buffalo Jump (Vintage Canada). Phyllis Smallman, Margarita Nights (McArthur & Company). Vicki Grant, Res Judicata (Orca). Susan Juby, Getting the Girl (HarperCollins). Elizabeth MacLeod, Royal Murder (Annick Press). Norah McClintock, Dead Silence (Scholastic Canada). Sharon E. McKay, War Brothers (Penguin Canada). Jacques Côté, Le Chemin des brumes (Alire). Maxime Houde, Le Poids des illusions (Alire). Andre Jacques, La Tendresse du serpent (Québec Amerique). Sylvain Meunier, L'Homme qui détestait le golf (La courte échelle). Antoine Yaccarini, Meurtre au Soleil (VLB éditeur). Pasha Malla, "Filmsong" in Toronto Noir (Akashic Books). 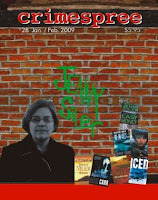 James Powell, "Clay Pillows" in Ellery Queen Mystery Magazine (June 2008). Peter Robinson, "Walking the Dog" in Toronto Noir (Akashic Books). Amelia Symington, "An Ill Wind" in Ellery Queen Mystery Magazine (Sept./Oct. 2008). Kris Wood, "Thinking Inside the Box" in Going Out with a Bang (RendezVous Crime). Daphne Bramham, The Secret Lives of Saints: Child Brides and Lost Boys in Canada's Polygamous Mormon Sect (Vintage Canada/RHC). Sharon Butala, The Girl in Saskatoon: A Meditation on Friendship, Memory and Murder (Phyllis Bruce Books/HarperCollins). Alex Caine, Befriend and Betray: Infiltrating the Hells Angels, Bandidos and Other Criminal Brotherhoods (Vintage Canada/RHC). Michael Calce & Craig Silverman, Mafiaboy: How I Cracked the Internet and Why It's Still Broken (Penguin Canada). Kerry Pither, Dark Days: The Story of Four Canadians Tortured in the Name of Fighting Terror (Penguin Canada). Pam Barnsley, This Cage of Bones. Gloria Ferris, Cheat the Hangman. Winners in all categories will be announced at the National Arts Centre in Ottawa on June 4. Congratulations to all the nominees. This year's annual Bodies in the Bookshop event is due to take place on Tuesday 21 July 2009 from 6:00pm. Bodies in the Bookshop is to be held at Heffers in Cambridge as usual. The line-up so far: Alison Bruce, Judith Cutler, Ariana Franklin, Meg Gardiner, Edward Marston, Rose Melikan, Malcolm Pryce, L C Tyler, Nicola Upson, Paul Waters and many more. Tickets, costing £5.00, will be available from May 1st and can be obtained from the Ground Floor Cash Desk (01223-568568) or by contacting Richard Reynolds on 01223-568532 or by email at literature at heffers.co.uk. Those of you like me who are avid readers or contributors to Crimespree Magazine will be aware that this august magazine turns five this year. If you have any special Crimespree moment that you would like to share whether it relates to the magazine itself or those two indomitable figures in the crime fiction world Jon and Ruth Jordan then please post here. Another of my favourite journals to which I have contributed at least one essay (and will hopefully in due course contribute some more) is 25 years old this year as well. The journal in question is of course Mystery Readers Journal. More information can be found on the excellent blog of the editor Janet Rudolph. 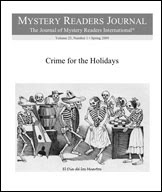 Congratulations to both Crimespree Magazine and Mystery Readers Journal on their 5 and 25 anniversaries respectively. According to Variety the entertainment newspaper, Matthew McConaughey is set to star in the movie version of Michael Connelly’s best selling and award wining novel The Lincoln Lawyer. More information can be found here. The rights to the film were sold six months before the book was actually published by Little Brown in 2005. Those of you that also enjoyed Lisa Lutz’s novel The Spellman File will also be pleased to learn that Barry Sonnefeld has been attached to direct the movie version of the novel on behalf of Paramount Pictures. The article in Variety can be found here. Barry Sonnefeld has been involved in a number of films including Get Shorty, Out of Sight, Lemony Snicket’s A Series of Unfortunate Events, Men in Black, Men in Black II, The Addams Family and Addams Family Values along with the remake of The Lady Killers. Further to my earlier blog about London Boulevard which can be found here, according to Variety a number of well-known actors and actresses have signed on to take part in the film. Further information from Variety can be found here.